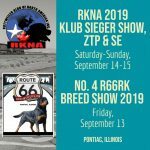 RKNA 2018 Policy Manual › Rottweiler Klub of North America Inc. Currently, version V3 of the policy manual is under review, as we complete each section of the manual it will be posted here. Having an area where the policy of the club can be easily accessible to it’s membership is important to the management team of the RKNA. Please refer to the “Old V3 version” unless otherwise listed below, eventually, the entire manual will be updated.